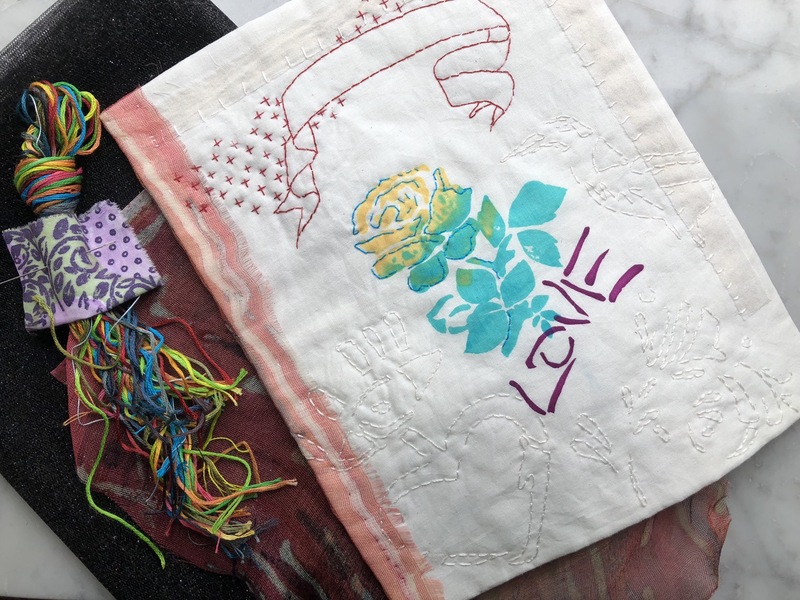 ‘I love to embroider’ kit and mini class. I have two handprint embroidery kits in my Etsy right now. Consider this to be a mini prototype class, for two, in a private FB group. I hope to make into a full online class, with your help. Are you game? 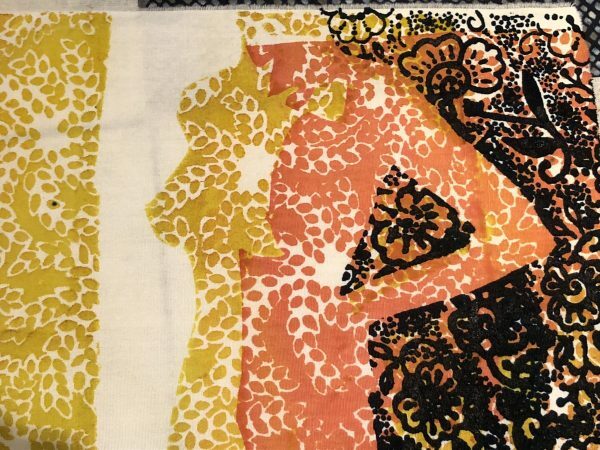 This online class, held in a closed FB group, will consist of video, photographic and written content, covering: knife edge finish, use of stencils, transfer pen, fill stitch recommendations and more. You will also have access to me in 2-10 minute Live FB Videos, where you are encouraged to ask questions and I will share similar and related work. 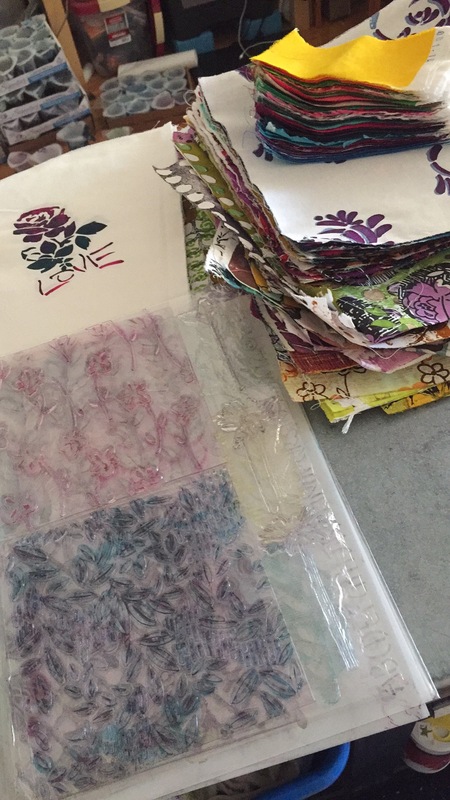 Each kit contains a Melly Handprint of a Rose / Love handprint, a hank of handyed embroidery floss in an array of sparkling colors, 2 6 strand DMC floss per color, 18″ long each, scrap handprints in sheers, velvet and more. There are samples of my favorite needles too. Just to let you know, a friend, A, is getting married soon. David and I both enjoy this person very much. And, I would like to make a gift for him. I am embroidering the third ‘I love embroidery’ kit while creating your video content. It is my goal to make this gifty-embroidered-square ooze with a NYC graffiti like appeal. This will be a lovely, intimate, learning experience and I hope you might be one of two to purchase these kits! This is a new idea for me, one I hope to make into a full blown online class. If you are interested in eventually taking this class, let me know in the comments and I will start printing more kits!! Heck! I would love to. Please join me. I assure you, this will be fun! Embroidery kits! Containing handprints! Threads and more! For a long while, perhaps a year or more, I have been having a hard time artistically. I needed to get a part time job, and I did. Its a good job, I like it. As in most things I do, I jumped fully into the job, started taking more hours, I began volunteering for more work. Until I felt a huge void. I was experiencing a lack of focus on my own art, and it hurt my feelings. I became disconcerted. Grumpy. I made things, but nothing was stirring the well. So what do you do when making art has become difficult? 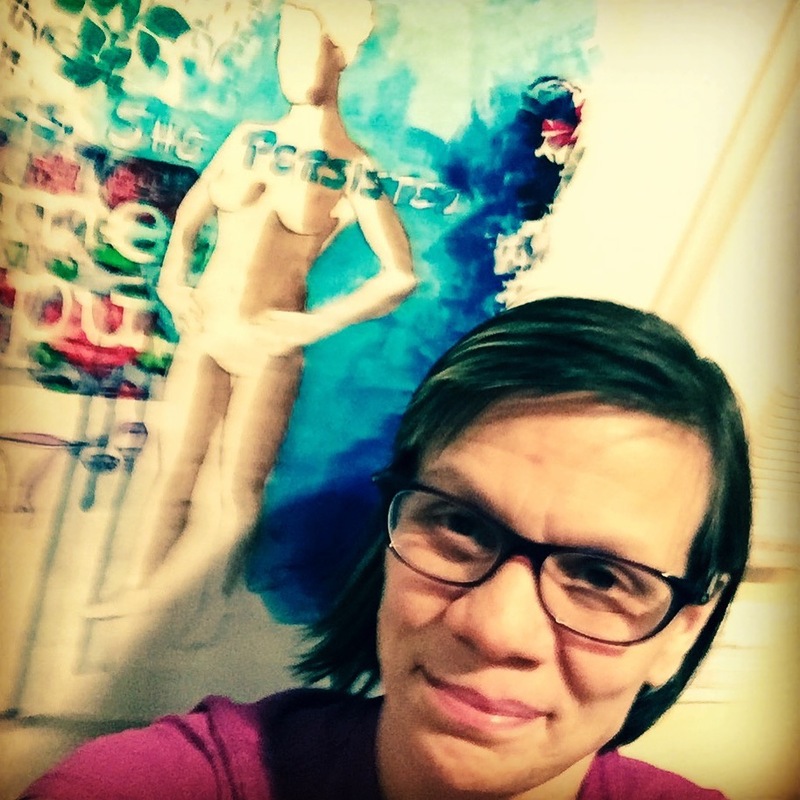 How do you reconnect with your art and begin engaging with it in a manner that bolsters and supports making? Often, in the past, I have changed media, swapping out dye for watercolor and paper. This time, I have begun cleaning (I am destashing and selling on Etsy, please check it out). Cleaning is magical, it moves energy and makes way for different things to come forward. I love cleaning. Then, a few weeks back, my good man and I went to see the David Wojnarowicz: History Keeps Me Awake at Night. As we walked through the galleries at the Whitney, I was amazed at what we saw and touched to my very core at the depth and veracity of that mans’ work. I felt the spark of the burning creative fire, that I have been longing for. I could see a pathway to my own creative endeavors forming. I listened. So, when I got home, I soda soaked cloth. Searched out imagery that I have been wanting to work on. Cut some freezer paper masks. I cleaned, and got ready to let the creativity flow. Geez, it feels good to turn a corner. Please check out my Etsy! I would like to continue to make space for this change. 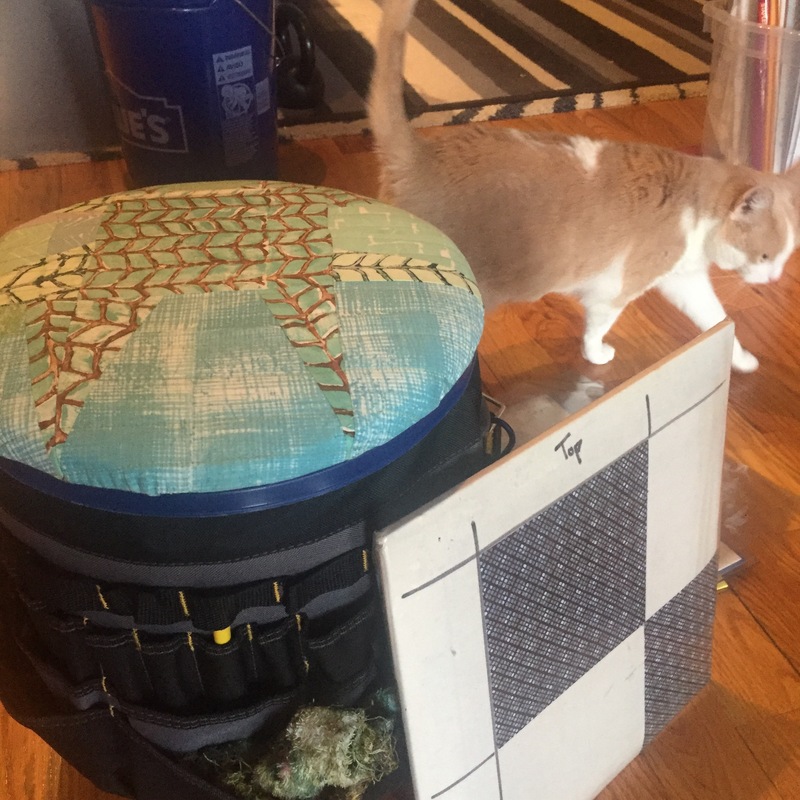 There are artworks, purses, a bolt of fabric, and other supplies and all are priced to move. Help me make more space for change! Thank you. 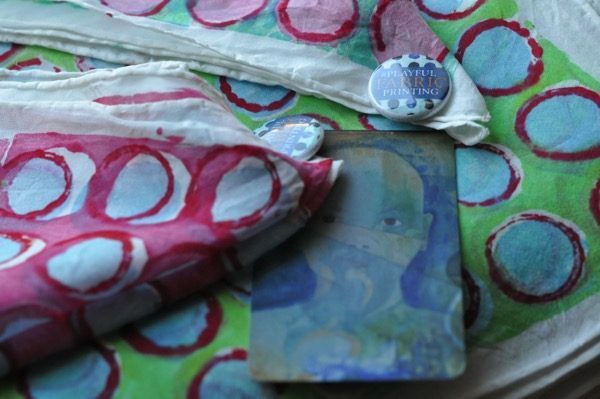 What do Amanda Palmer, Jasmine Power and mail art have to do with one another? 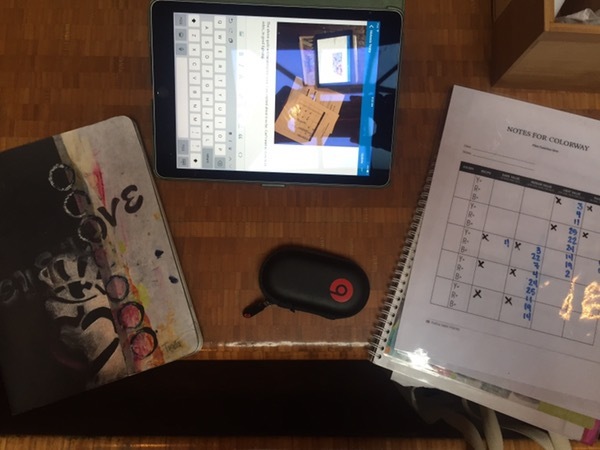 This is one of those days that I have so much excitement, my blog post goes in two directions. 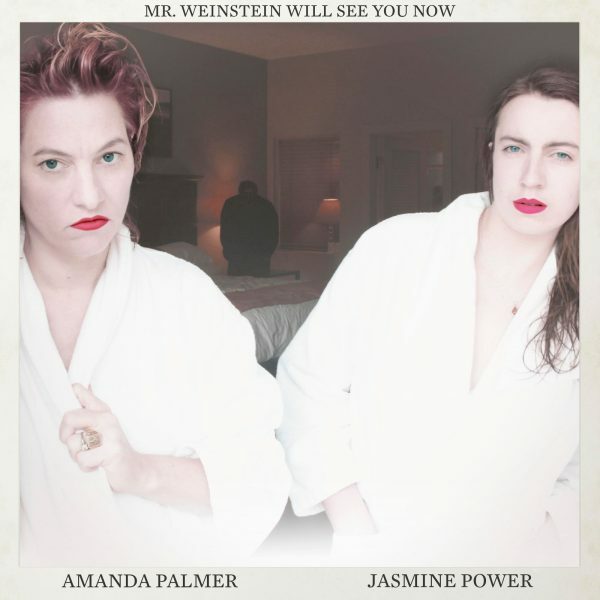 First, I participated in a video shoot with Amanda Palmer and Jasmine Power for a song called, Mr Weinstein Will See You Now. The subject matter of which, is deep, poignant, and timely with a transformative power. I am a member of the ‘Weinstein Chorus’, one of 50 women, dressed in white shirts, who sing and run in different scenes. Lyndsay Katt plays a part too (remember my Genderless Fae debut? Lindsay pointed me in the direction of this amazing opportunity while participating too). Amanda and Jasmine’s song has been released, you can get a copy of it off Amanda‘s website. Soon, the video will come out too. To participate in this video was to heal my person. I have been crying tears and processing what my participation has stirred within me, which is tiring, if good work. I pray the sheer magical and poetic beauty in this video, will fling itself out into the world and help heal the wounds we women carry. I feel so grateful to play a small part. Amanda Palmer and Jasmine Power are fierce females with a huge vision. I have returned home to work with a 6″ repeat utilizing the Rose and Forget Me Not motifs. In exploring how to carve these flowers, I carved a single motif, upper left. These exploratory findings are rich for playing around with how to color the design. While playing around with this, I printed several postcards, which you can see at lower right. Because I love mail art, I placed these postcards in my Etsy. If you purchase a 5$ handprinted postcard, I will address it to you (or yours), place a Priority Mail stamp on the card and write a message to you, prior to placing the postcard in the mail. I hope you want a postcard! I would love to write to you. I printed a postcard for Amanda, provided a stamp and pen, while suggesting she write to herself-I felt too shy to ask her to do it right then and there. I hope she does, though. It will feel complete to me, when that happens. As I am feeling life deeply and well, I will retreat for a while and delve into carving my next repeat. I look forward to be able to print this! 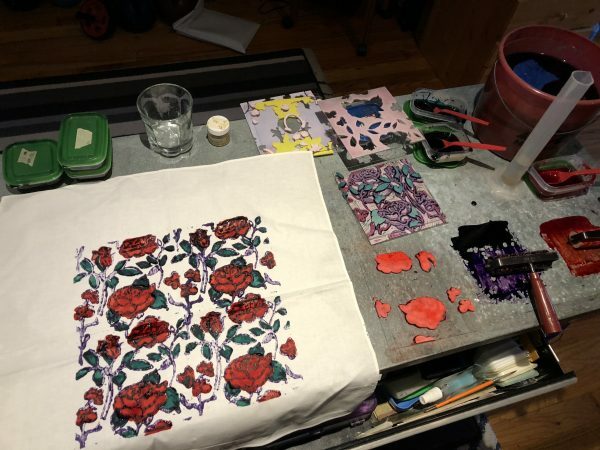 This weekend, I completed printing the 48 Blowsy Rose hankie fundraiser to benefit METAvivor. I have sold 47 out of the 48 silk habotai handkerchiefs. I am going to purchase one (I mean donate on behalf), because I need to start collecting -my own- hankies. If the final hankie does not sell today, I will ‘buy’ that too. Tomorrow, I will send 240$ to METAvivor, as this is the listed end date for trying this idea out. I am so happy to be able to donate money, print hankies, and that YOU will own a piece of my work. Thank you so very much!!! 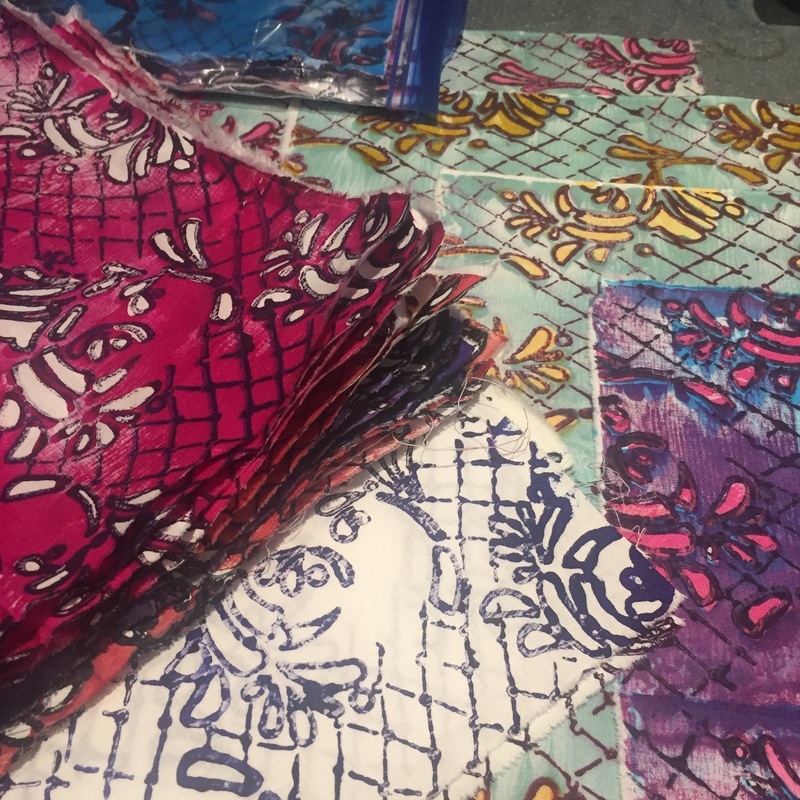 At the end of the print job, I searched around in my bin of Salty Soda Soaked (Playful Fabric Printing, page 45) fabrics and found a few cotton bandanas. You can see they are quite a bit bigger than the dainty silk habotai hankies. I have them and ought to print them, don’t you think? I want to try and rectify the large area of white. When Carol and I were writing Playful Fabric Printing, we came up with the concept of creating a selvedge with our names on it. In the meantime, I have 48 silk hankies to steam, wash and mail away. ALSO! I put 20 copies of Playful Fabric Printing up for sale on my Etsy page, for just 20$ each. I want to get these books into your hands, so we can start using it! 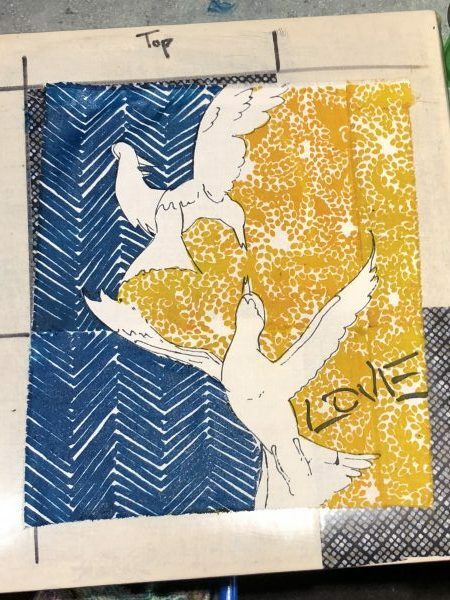 If you would like a more in depth exploration of printing these hankies, join our closed FB Community page, Playful Fabric Printing. This is where we do weekly Live Video chats, on print related subjects-this week steaming! 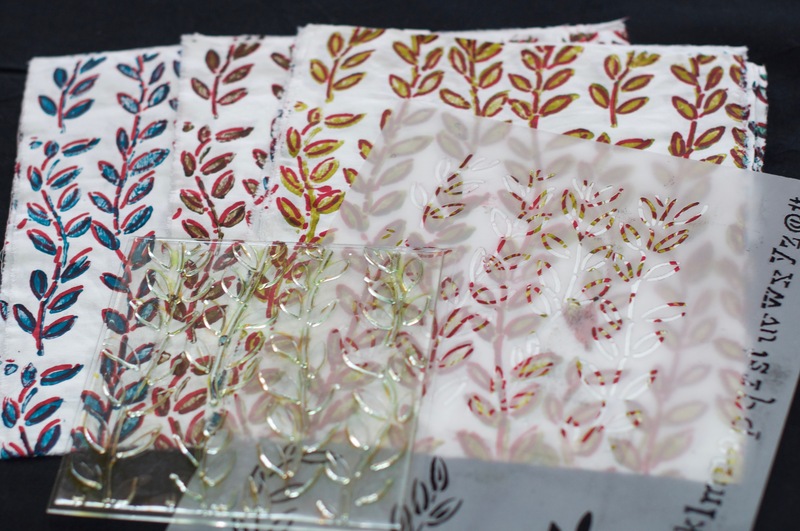 There is a backlog of video in the group, which will help you on your way to playfully printing your own fabrics. Blowsy Rose hankies, chugging right along. Doing this fundraiser for METAvivor has been fun. 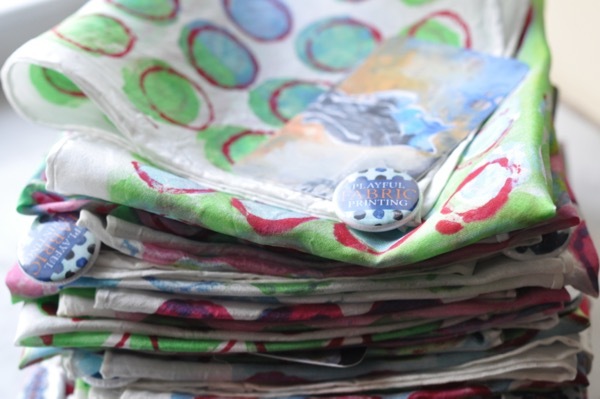 I get to print 48 hankies, make some cash for myself and give some cash to a group whose work I admire. 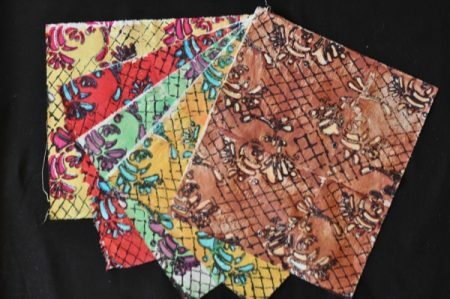 I have just 4 more hankies available for sale. I would love for you to own one, but I also feel kinda grabby! I might need one for myself. SaveSaveThese hankies are not yet steamed, meaning they are stiff with thickener and Procion MX dye. This is my favorite way to view them! I understand that in steaming and washing them, they will change some. The color will release and fade minimally. What I see here is not what they will eventually look like. But this is my favorite part of printing. 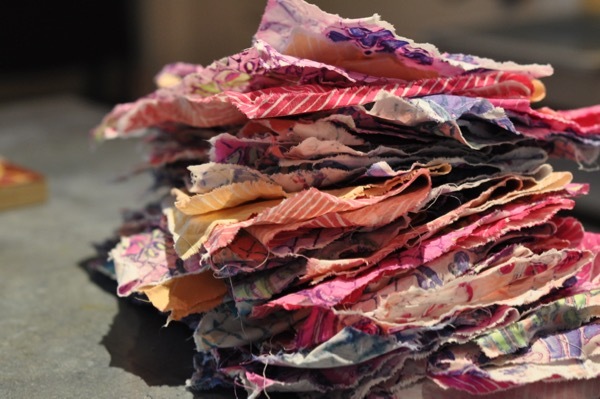 Being able to sort through and think about these hankies in their final state is exciting! I must color the petals of about 22 more hankies. This work will be complete today or tomorrow, then, I will begin to steam, wash and mail the hankies to you. I am ever so grateful to do this work and I feel honored to be able to donate up to $240 per print job!! That’s $240 more than I could afford on my own. So thank you!!! Get your Hankie here! Plus. 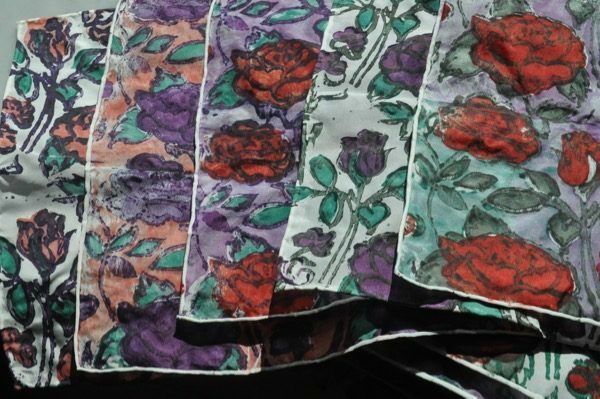 As I talked up the creation of the VIP Offering to the AnaOno #cancerland fashion show, many expressed interest in owning their own Melly Made hankies! 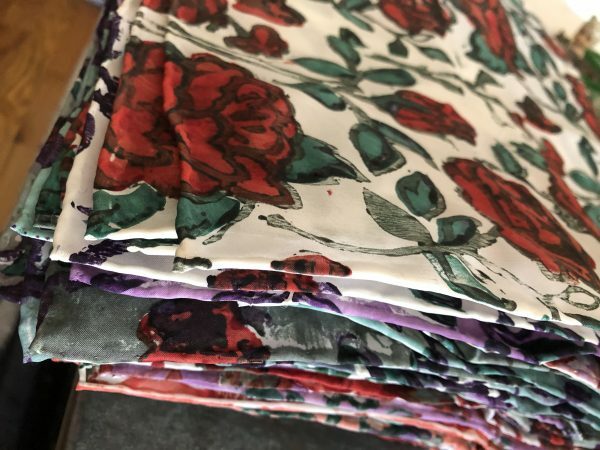 In gratitude for this opportunity, I have decided to print 48 more hankies and donate a portion of the sale to benefit METAvivor. I have ordered 48 more hankies. 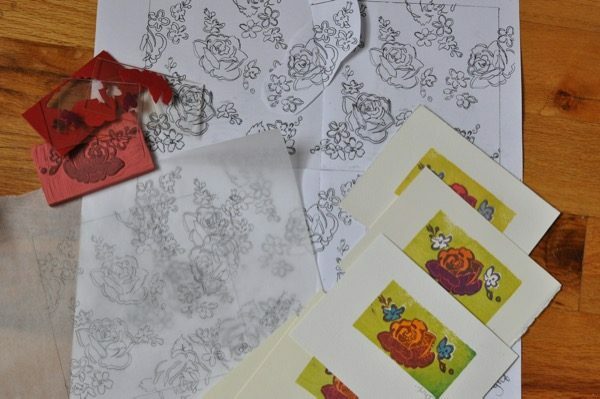 I plan to print them using the large floral design featured in Floribunda! by RJR Fabrics. Each hankie will cost $20.00, with 5$ of each sale donated to Metavivor. Each hankie will be mailed via USPS stamped envelope. If you prefer UPS shipping let me know, I will send you an additional request for $ to cover the cost. Please purchase your hankie through my Etsy store. 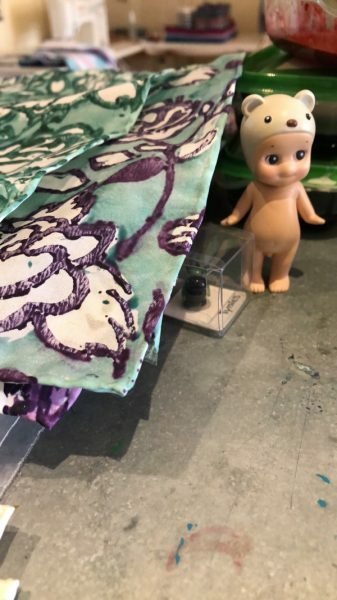 While there, perhaps you might purchase Playful Fabric Printing, then head over to the Playful Fabric Printing Community page on Facebook! I will be doing live video updates while completing these hankies and would love to see you there! My fingers are crossed that I sell all 48 hankies and be able to donate 240$ (my fingers are triple crossed). Since taking this Free Range Textile Printers show on the road, I have printed about 80 Lace Swirl and Herring Bone fat sixteenths in total. In keeping with a recent love affair with Half Square Triangles, I went to work trimming them all to 8.25″, I like to cut them one at a time to maximize them as much as possible. After which, I paired them, right sides together, in groups of two, with an eye toward a light/dark pairing. I then marked them with pencil before piecing, cutting and ironing. 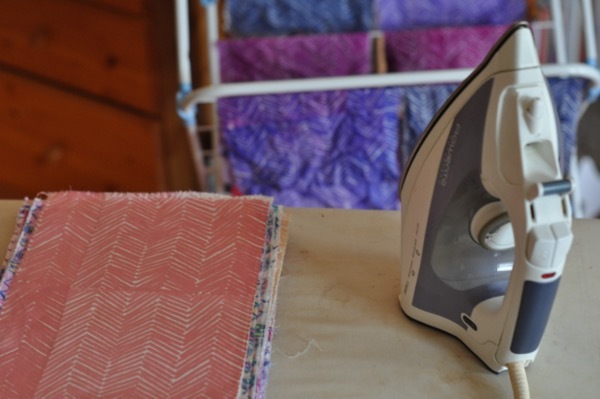 This quilt has me thinking about the use of starch when ironing, so I went to Facebook to ask others for their experience. This interesting thread emerged. Check it out! 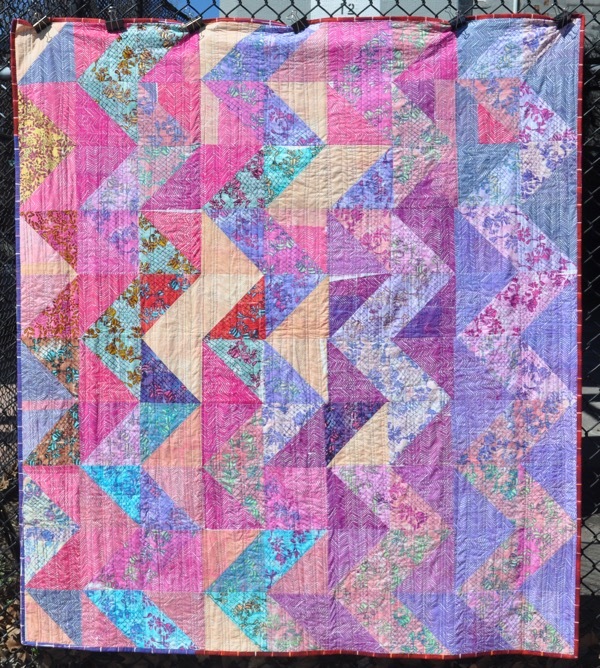 My love of the Half Square Triangles will not abate! The initial cut size is such that quilt tops quickly emerge, which is especially to my liking. I like making quilts, quick and easy. Large blocks help me do that. I really appreciate the back side of handprints too. The above print (the red) must have been a really juicy print to smoosh through the cotton print cloth like that! And it is so pretty to see how the printed layers of color interact with each other. The above quilt will be complete soon. I am excited about it so far. Can’t wait to show both sides, in good lighting. Normally I track these print jobs pretty closely. This time, I went about the entire thing in a much different manner. Tracking got cast to the wayside. I could track this lot retrospectively, by counting and comparing. I will see how far I can get. I could lead to a ‘printers must’ or pattern. To explain what I mean by a “printers must”, I need to harken back to my days as a sample cutter for a small women’s wear company. At the beginning of the day, I would be given a, “cutters must”, which looked something like this. From this, I could discern the path and needs of each cut sample on my docket for that day. Basically, I was given a pattern and the ‘cutters must’ were the directions. This in the hope of offering a Playful Fabric Quilt pattern. I have a bee in my bonnet. Goal #1 Make a downloadable pattern for Melanie Testa.com. This last weekend was quite productive. 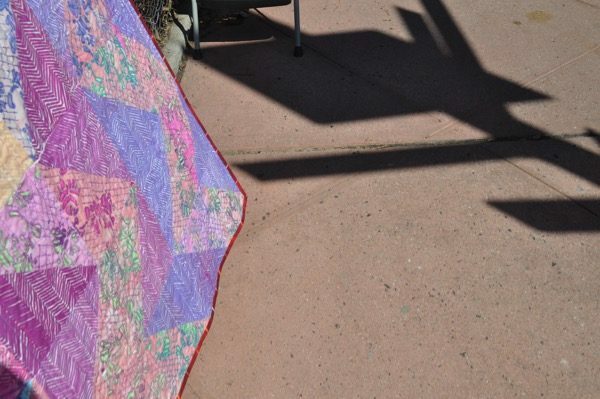 I took Bucket to my twice yearly quilt retreat and made great progress while #freerangetextileprinting. Then, I came home, switched out the newspaper and tinfoil I had been using to steam (this is a link to Pokey Bolton’s blog related to our Playful Fabric Printing blog hop-who chose the steamer as a topic), and got to work. 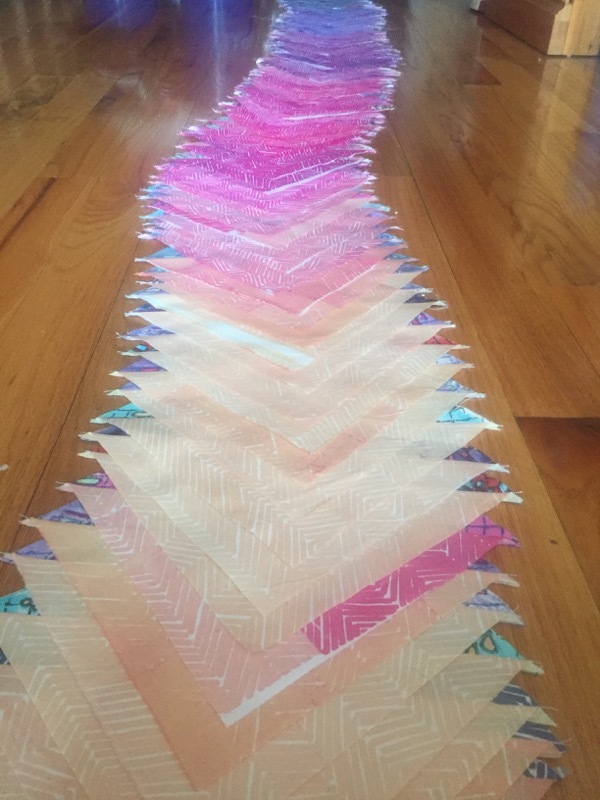 I now have about 39 Melly Marks Lace Swirl and 50 Chevrons printed and ready to cut and piece! This is why I love steaming and boiling. Steaming and boiling is a transformative experience. I love seeing the prints pile up, all stiff like potato chips, then, I like seeing the final shade after boiling and drip dry. I think this is a great coloring of the Lace Marks multicolor print set. The swirl is printed in Medium and the innards is Light value (I can figure out which color number if you want this info!) 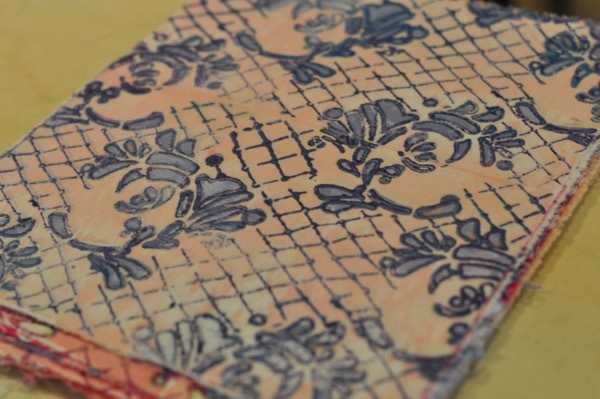 Combined with the pale pink ground, I feel this color way really highlights the lacey design. Here is a pile of ready to iron handprints. They look like potato chips to me. They act like it too. I am so excited to make a new quilt top, I could eat these like potato chips! If only they tasted as good. 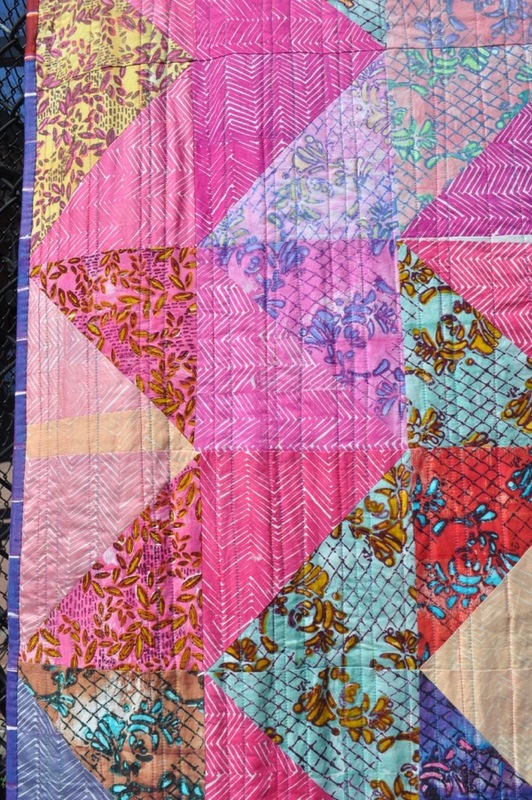 I hope at the end of making this quilt to come out with a ‘pattern’, that states how many prints, provides a color way, and breaks down the making the quilt. I hope you might like this idea. I would love to hear your thoughts about this. I am offering my first Etsy Shop coupon code, use the code MELLYMARKS1 to receive 4$ off an order of 20$ or more, in my new shop! This code will be available until March 28. 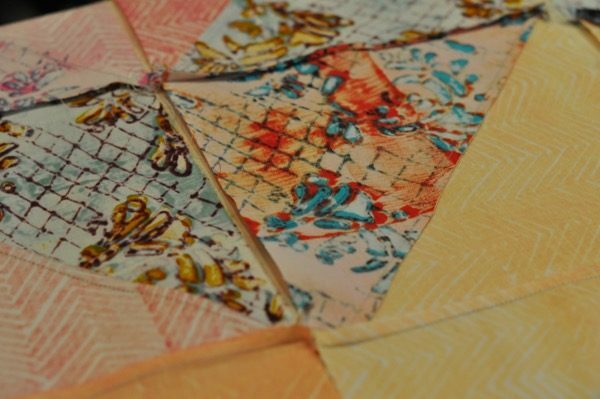 And, join the Playful Fabric Printing Community page on Facebook. 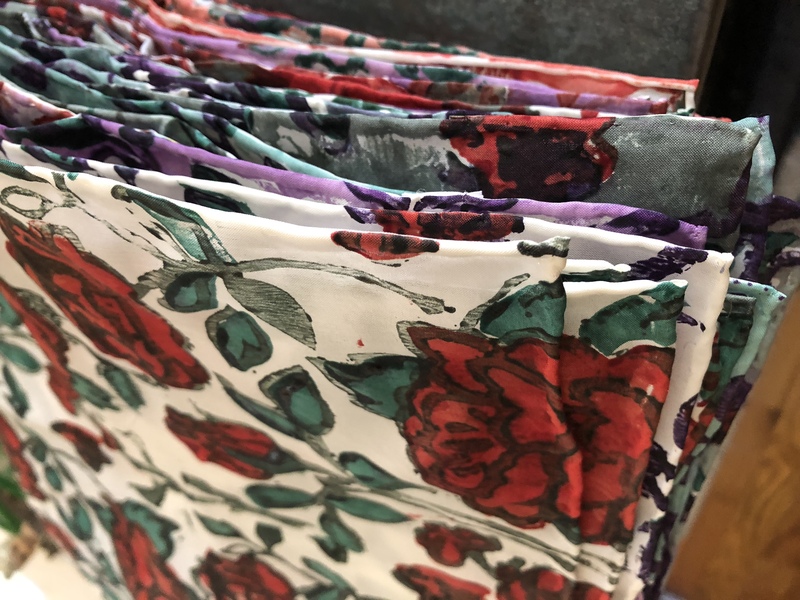 Additionally, comment if you would consider becoming a Sample Maker for my upcoming fabric line, to be release at Quilt Market!!! I hope to teach at Schweinfurth Art Center in May, please join me. This class will expand upon the principle presented in Playful Fabric Printing. I couldn’t rush my current Speed Print! I would really like some Chevron single color prints to fill out the use-ability of these hand prints in a quilt top. I had previously hoped to steam and sew this coming weekend, a retreat weekend. But. I have decided to slow down and do it all. Check out the last quilt I made at Retreat!! The Peacock Quilt is also on page 125 of Playful Fabric Printing!! 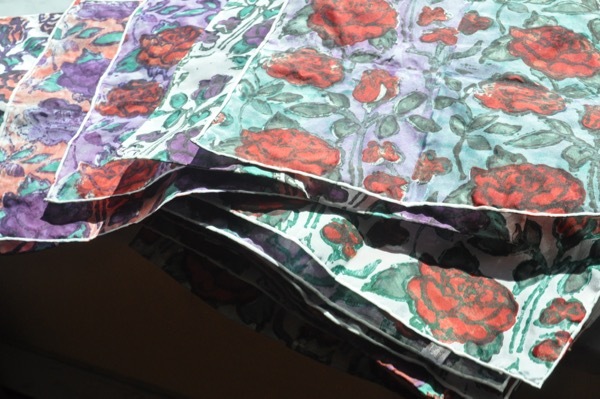 But, this time, I will be printing the fabrics for a quilt and not lugging my sewing machine. I have taken out and am dusting it off, the Free Range Textile Printers bucket. I am taking this show on the road! Peach inspected all sides of the #freerangetextileprinter ‘s Bucket. She admits it lacks necessary tools and will require re-inspection prior to launch. I love retreat group. I miss these gals and I look forward to getting away, even for a short while. 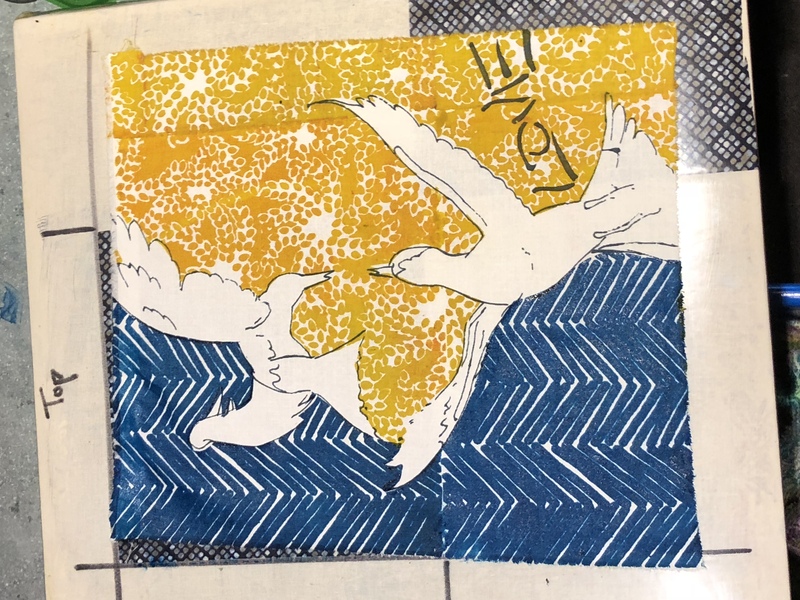 I don’t know how many pieces of fabric are in this Speed Print session, but when it comes time to piece and make a quilt top, I will be one content quilter. Are you a member of our Playful Fabric Printing community page on Facebook? We post videos, answer questions and participate in discussion about member work! 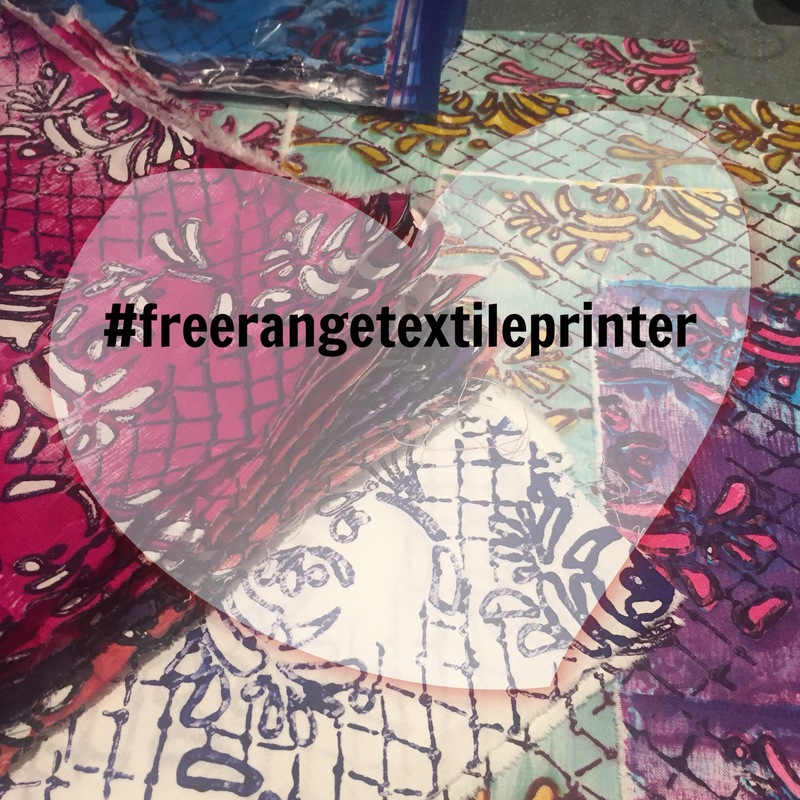 There have been some great fabrics printed and shared, recently! You are welcome. Please join. 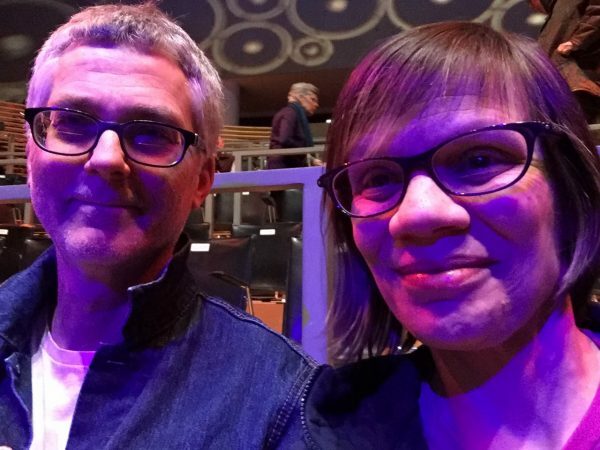 It started with tickets to Jazz at Lincoln Center , a happy couple, and some great lighting. My weekend continued with a request by my Man to change my cellphone lock screen to this image of David Bowie. And I couldn’t agree more. 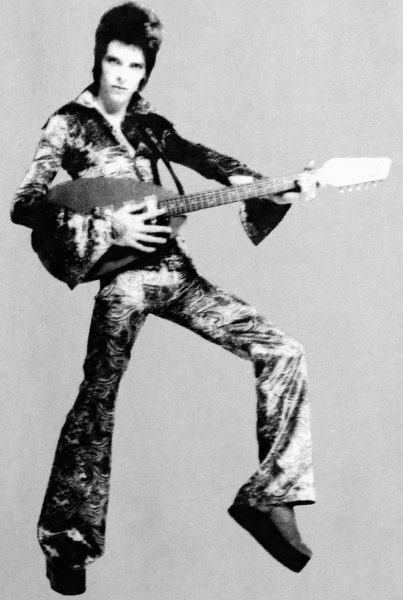 I remain ever grateful to have walked the earth during David Bowie’s lifetime. When he died, all of them died. Long live the many lives, and personal recreations of David Bowie. I am working on my Threads of Resistance piece. It speaks to women and ‘the female body’, using recent news headlines to highlight matters of gender oppression. Decorative elements abound, of course. This is a work in progress, I will update the blog about it as I progress it. It will measure 20″ square and will have a knife edge finish. It will have machine quilting, and (I hope) embroidered elements. I haven’t made a piece in this manner for a very long time. This is fun! 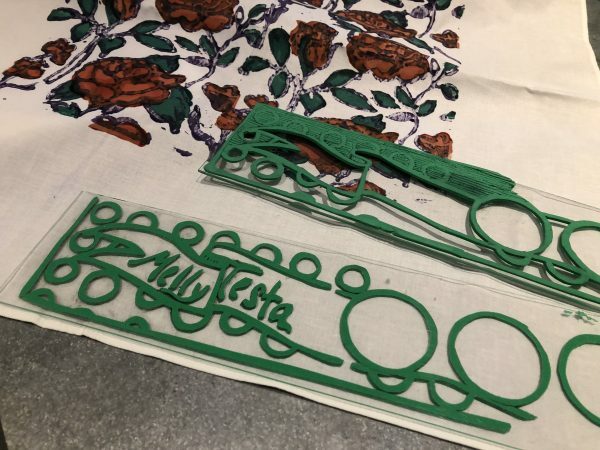 At the same time, I am printing up a storm with Melly Marks Kits. Sunday, I gathered as many printed items that could be steamed together. By the end of this week, I will have processed a new batch of color triangle swatches, a Speed Print session related to all the Melly Marks repeats, and more. I love steaming, because it means lots of printed cloth, ready to use!! So? How about you? 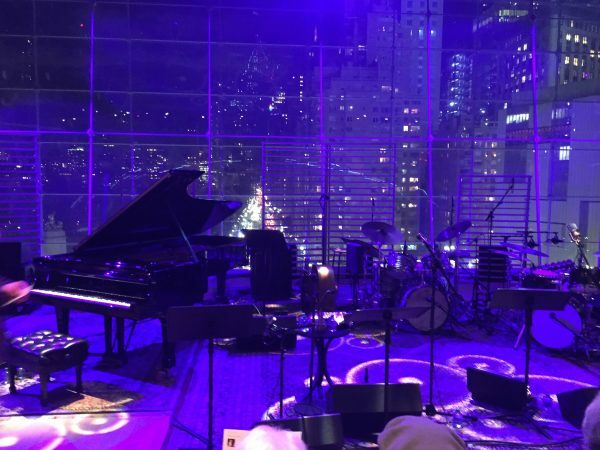 What were you up to this weekend? In learning to use the concepts Carol and I present in Playful Fabric Printing, I have done a lot of experimentation (we both have). 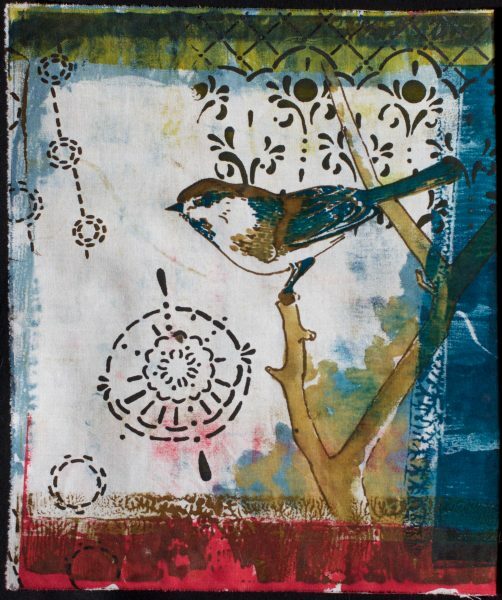 In retrospect, as I ponder my approach to using dye paste and printing as is described in our new book, I would say, at first I was exuberant, I threw caution to the wind, I tried every combination of color and value. And I made many printing errors and color missteps in the process. All of this experimentation has had the effect of helping me build color preferences and forge an understanding of how value adds a visual pop to a print. 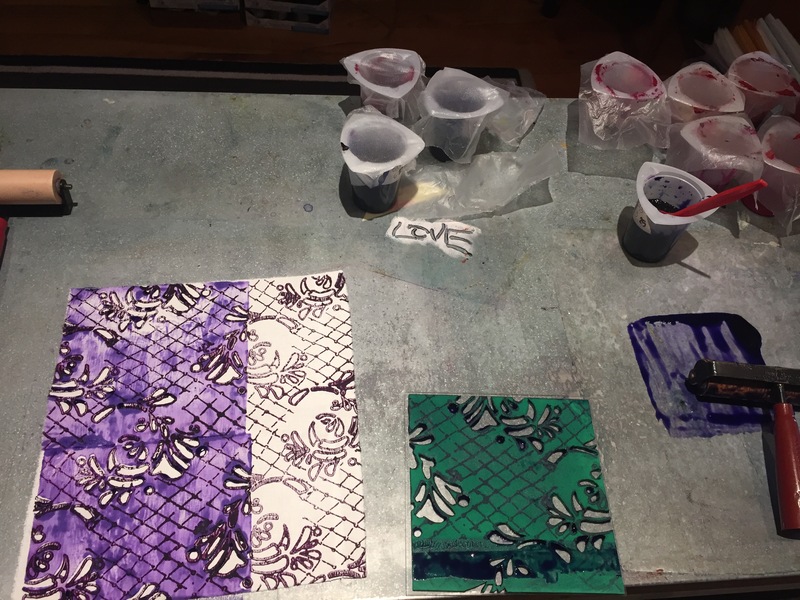 In Playful Fabric Printing, we illustrate how to mix color in four gradations, Dark, Medium, Light and Pale (Pale is my favorite). 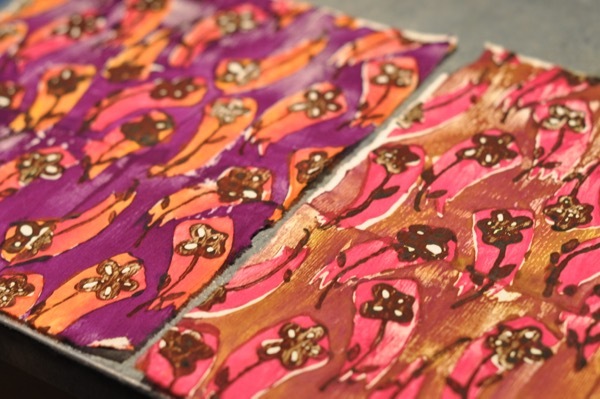 In the above prints, (using this Kit), the purple print uses color much more judiciously than the right red brown print. For one, purple and orange are complementary colors, they reside opposite one another on the color wheel. Because of this, the color sizzles, the purple and orange push one another around, seeking dominance. Also, where the purple is a Medium, the orange is a combo of Pale and Light values, which adds to the zing. The red brown print is quite nice, but the color choice is a bit flat. These colors are analogous and close relatives in the color wheel. A more effective background color, one that pushes the daisies to the forefront of the design would make this print even better. I am not saying that you ought to work on opposing sides of the color wheel in order to make a great print, though. Rather, a cleaner color choice within the analogous range or a more effective use of value might help propel this design forward. These two prints, (using this Kit) are both quite pleasing, in my opinion. The differences in color choice are quite interesting. 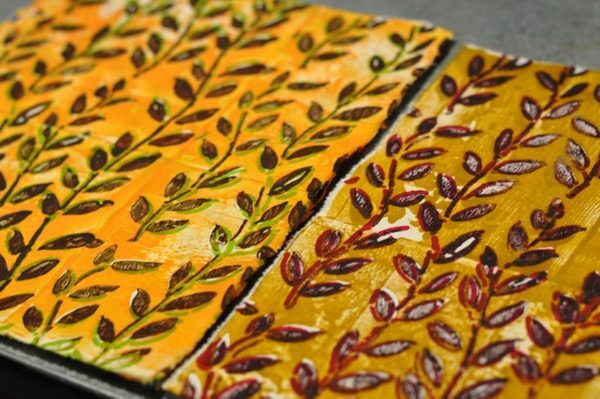 The left most prints’ background is a crisp cheddar while the print on the right is an earthen ochre. The print on the left is bright and chipper, with its flash of light green, while the print on the right has a bit more muscle. Would I use them in the same quilt? Perhaps. It would depend on their fellows. Just looking at them side by side though, the print at right makes me want to create a quilt top with an autumn appeal, and the two would not go well together, if that were to be the goal. I am happy to say, all the the experimentation I have done has lead me to a more purposeful and considered use of color. Being exuberant has helped me to understand the difference between printing green on top of a crisp yellow-even before I apply dye paste to tool and then print the cloth. Which is why I encourage you to play, experiment and try out every combination you think up. Melly Marks Kits, StencilGirl stencils and my new Etsy Store! I am quite happy to announce that I have opened a store through Etsy, called Melly Marks Playfully. At-the-same-time? 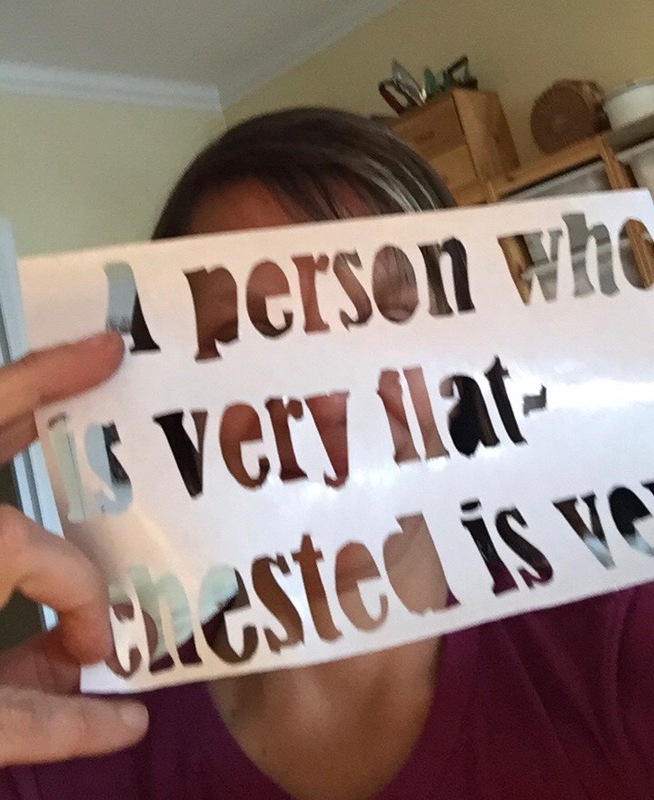 StencilGirl is releasing a line of stencils in my name!!!! In the coming days, we will announce a print-along in the Playful Fabric Printing Community Facebook page. 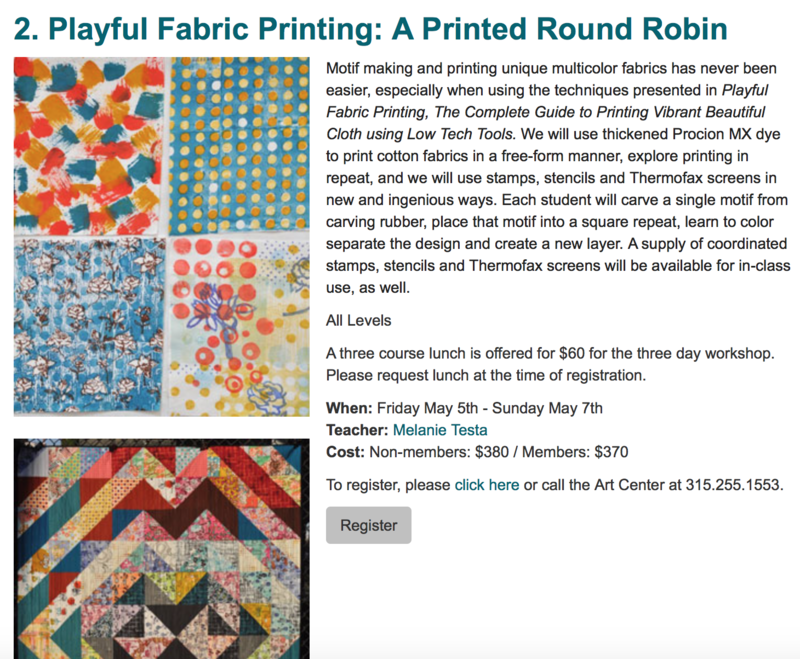 I would love to print along side you as you learn -to use- Playful Fabric Printing. And Carol is excited about this too! 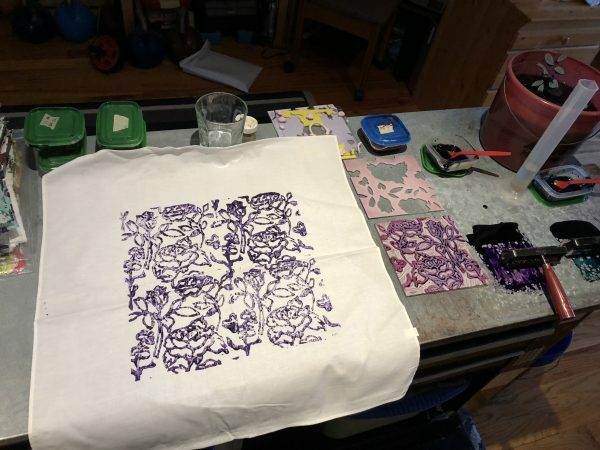 This print along will not be akin to an ‘online class’, but rather, remain reliant on your ability to work through the pages of Playful Fabric Printing on your own while being able to draw upon a community of playful fellow printers and textile designers alike. At the same time, I am offering Melly Marks Kits, coordinated textile designs offered through stamps, stencils, and tFax designs. All, for your printing pleasure. Video content in support of this will be provided through the community page, so please join!! I am selling Kits, StencilGirl sells individual stencils. I take pride in saying, I am manufacturing with companies who employ American people and work on American soil. As a result, my retail price points are not as low as I would like them to be, but if you show me that you like my offerings by purchasing these kits, I promise to do everything I can to lower these prices as much as possible with my next offering. In the meantime. pick up a copy of Playful Fabric Printing, make an order at PRO Chem or Dharma, and let’s get ready to have some fun!! NOTE: In the upper right corner of my Nav Bar? There is now a tab that opens to my Easy Store! I hope to sell handprints and artwork though this store too! Please, stay tuned.